It’s hard to believe that we’re nearing the end of 2017. It has been a wonderful and busy year for the Travino team. Residents of the award-winning Travino Square are settled into their new homes, Travino Landing is just a few months from completion and we’ve broken ground on Travino Gardens! At Travino Landing work inside the building is progressing quickly. Over half of the flooring has been installed and painting is well underway. We’ve also begun to take delivery of the sparkling new kitchen appliances and will begin installing those in the coming weeks. Doors throughout the building have been installed and light fixtures and closet organizers are being installed in the third and fourth floors. The beautiful weather has been a welcome break from the rain for our crew at Travino. They are moving along on the early stages of construction for Travino Gardens. 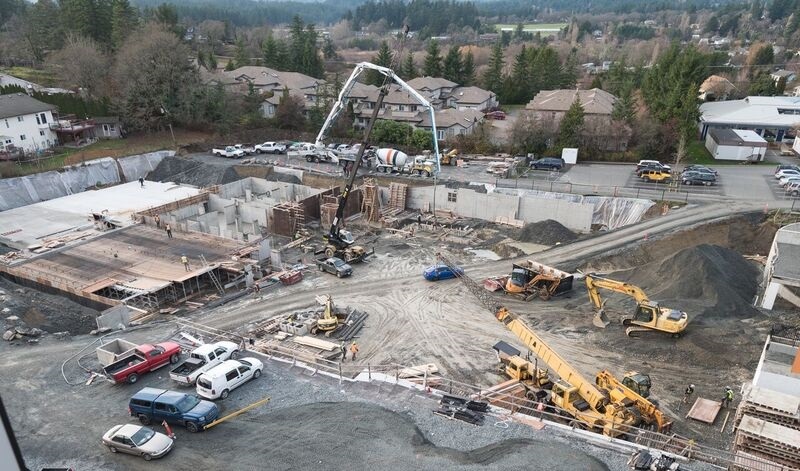 The underground parking is well underway and plumbing for the ground floor is being roughed in this week. A few months ago Mike Geric Construction made a donation of $50,000 to the Royal Oak Middle School to complete their fundraising campaign to build a new playground for their more than 500 students. We were delighted to see the playground equipment was recently delivered and installed. Though the holiday season is quickly approaching, we still have lots to accomplish at Travino, so stay tuned for more updates in the New Year.